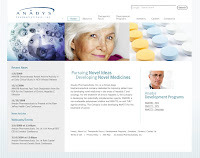 Our third site launch of 2009 was for Anadys Pharmaceuticals, Inc. (Nasdaq: ANDS). Anadys is a clinical-stage biopharmaceutical company dedicated to improving patient care by developing novel medicines in the areas of hepatitis C and oncology. With new developments happening every day, Anadys is certainly a company to keep your eye on…and definitely one to root for. Paul Amelchenko is Creative Director at bfw Advertising in Boca Raton, Florida. bfw Advertising is a full service marketing and communications firm with strong competencies in new media. The South Florida advertising agency creates and builds client brands with strategic thinking and on-target creative executions. For more information call (561) 962-3300 or visit www.gobfw.com on the web.